I have been working on more Latin translations of Jinty serials. In line with Comixminx’s entry on Portuguese translations, I have taken a select few from the list and provide some commentary on them rather than posting a long list as I did before. I couldn’t find a Latin word for Toltec, so I came up with “magic sceptre” instead. From there it was an easy matter to use the protagonist’s name to provide alliteration. Perhaps it is not as effective as “Sceptre of the Toltecs”, but it is alliterative. As Comixminx says, girls titles would not be complete without alliteration somewhere. This was a tough one to translate. I doubted I could find a Latin word for “jinx” that had the same context as the original title. So I googled for a Latin word for “klutz” but then it was pointed out the word may be not so suitable as it had other more negative meanings. So in the end it was “citeria”, meaning “clown”. It was alliterated with “carus –a –um”, meaning “beloved”, to express that Katie may be a jinx but everyone loves her, including the girls who regularly suffer from her jinxing. It also provided alliteration and a dash of humour that was in keeping with the strip being a humorous one. This was another tough one. I was thinking along the lines of a title that reflected the curious relationship between sport and dancing that ran throughout the story, but I couldn’t figure out how to go about it. Eventually I hit on the idea of something like “dancing around the game”, but as this sounded like Nadine was fooling around with the game, it became “dancing through the game”. Originally I toyed with a translation that reflected how Mandy used her daydreaming to escape an intolerable home life. But I changed my mind and began to develop a title that commented on the mystery that surrounded both the hatred Mandy gets at home and the tests she undergoes, and the mystery of how and why they were connected. The adjective used for them both would provide the alliteration. “Perplexus –a –um” was chosen because it was recognisable to English speakers. It can also mean “interlaced”, which could also serve as a play on the hatred and the tests being connected. A title that used “brooch” was rejected because the Latin word for brooch can also mean “buckle”. Eventually I found there was an actual Latin word for “scarab” and developed the title with that. The noun “plaga –ae”, meaning “strike” or “plague”, was chosen for association with the scarab because it was short, strong and instantly recognisable. It was also reminiscent of the Ten Plagues of Egypt, which tied in with the Egyptian theme and what the scarab does. A title that used “evil” was rejected because the necklace was not downright evil, just angry. So the title began to develop from there, and the Latin words for “wrath” and “Indian” provided alliteration. Yes, the Latin version of Comixminx’s Portuguese translation. I think it works even better in Latin because the Latin words for “golden” and “silver” both begin with “a”, which gives an alliterative effect. This started with “siccitas longa” (long drought), but it didn’t sound a very thrilling title. So “haruspex -spicis” (diviner) was added because it would sound like an intriguing word to English speakers and therefore provide more interest. Finally, “siccitas longa” was capitalised because the people in the story would be very likely to use capitalisation for the drought when they look back on it. I have been on a bit of a hiatus recently due to a very busy patch at work and some achy wrists from too much typing. Things have now settled down on both fronts so hopefully I will be able to ease myself back into blogging – and of course Mistyfan has been keeping things going on the blog with a recent focus on stories published in other titles and issues of other titles too. 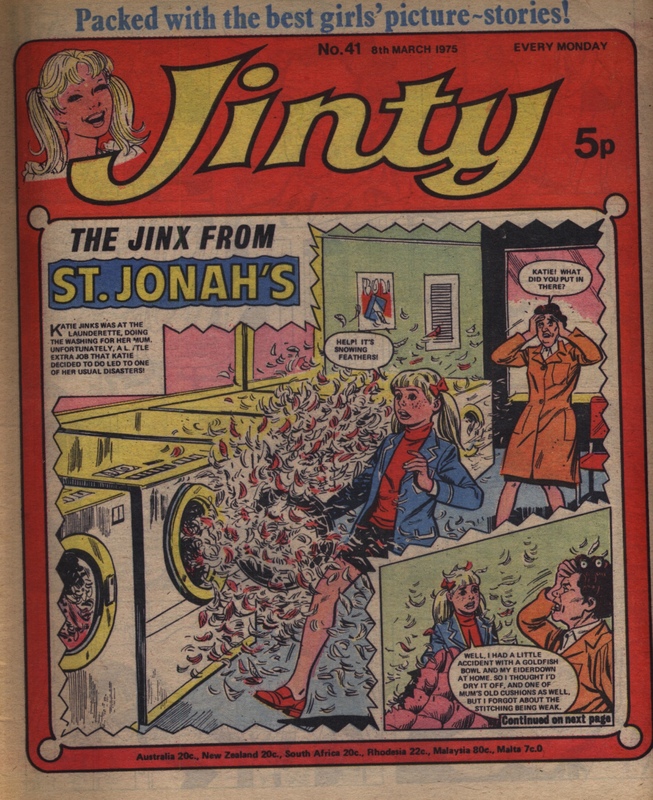 This is issue 20 of Jinty and it feels quite thick and substantial – on counting the pages, it seems this was still running at a 40 page length at this point. There’s certainly quite a lot in it – the Katie Jinx story is a four-pager which continues a short story arc about Katie learning how to do hypnotism. She’s not quite as successful as she thinks she is being, because her school chums are fooling her by pretending to be hypnotized! But can she hypnotize a charging prize porker before it flattens her? I suspect not! In “Jackie’s Two Lives“, Jackie meets Mrs Mandell for the first time. Of course she has to lie to her family in order to do that. That is only the tip of the iceberg, as Mrs Mandell starts to manipulate her further. It sounds so innocuous but it will all end badly, as we know. Wenna is being persecuted as a witch – her local friends are being prevented from seeing her by their prejudiced parents. In fact the whole class of her year have been kept away from school – very cruel! Not surprisingly, Wenna takes this as a cue to run away. The family in “Always Together…‘ are already runaways – elder sister Jilly is shocked to read in the paper that the water they have been using in cooking is polluted and likely to make them ill. Indeed, they all end up coming down with something. Jilly bravely keeps things going but once they are better there are the continuing challenges of before. How will they get enough money to eat and sustain themselves? Jilly’s talent for sketching will hopefully help but that might not be enough, because the little family are still not very strong and healthy. In “Jinty Made It Herself” the reader is advised on how to adapt an old jumper into a different piece of clothing such as a tank top. Linda is feeling very left-out in the story of the same name. Her mother has remarried and she has a step-sister, which rather spikes Linda’s plan of being expelled from school so that she can hang out with her mother and be as close as they were before everything changed. Step-sister Lorette seems rather nice and is certainly trying hard to be friends but Linda is having none of it. What’s more, when she does try to make amends by cooking tea, it all seems to go wrong and she is unhappier than ever. Merry at Misery House is unhappy because her parents are suffering money troubles due to her father being taken ill. The other reformatory girls come up with a plan to earn a bit of cash that Merry can send off home. Unfortunately the way they earn it involves exposing themselves to illness, and soon the whole of Misery House starts to come down with virulent influenza. Yikes, that’s a real killer. Daphne of “Wild Horse Summer” is made to go out picking sloes with the other orphanage children – everyone’s being very kind but all Daphne wants to do is to see the splendid white horse that she is secretly making friends with. On her ride, though, she spots that the farmhouse is on fire, with no-one left there to put it out! Her secret will be out but she has to alert everyone. Finally, “Angela’s Angels” features a daring rescue from a crashed light plane – nurse Sharon rescues her hero, Neil Crosby, a tennis star. Fat lot of thanks she gets from him when he realises that he is paralysed and may never be able to walk again! There are lots of anguished faces in the beautiful art by Leo Davy. 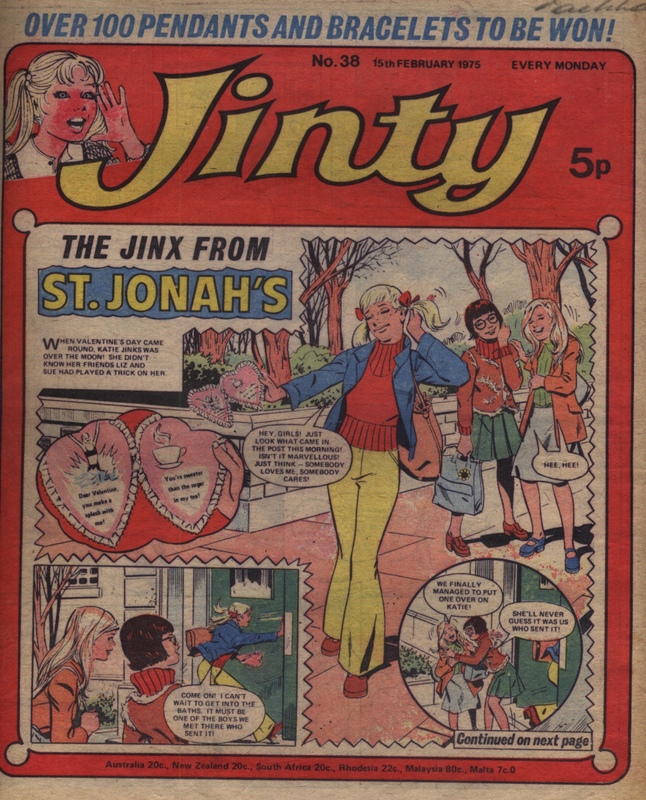 This issue says farewell to the serial that came over with Penny, “Seulah the Seal”. This must have been a bit sad for former Penny readers, although the ending is happy. We are also introduced to a new Trini Tinturé story, “A Spell of Trouble”, about the Blacks, who are a family of witches that find their magical lifestyle is under threat. Is it a witchfinder? Is it a witch-hunting mob? No, it’s a gormless non-magical cousin who is such a walking disaster area she would make “The Jinx from St Jonah’s” look competent. Pam of Pond Hill starts a new story too. Hazel Bayley, who has no friends and isn’t popular, kindly gives Pam a macramé potholder when Pam has difficulty making one for Mum’s birthday. But then Pam sees the same potholders in a department store, and surely Hazel couldn’t have afforded the £5 for one! Pam can think of only one thing…but it couldn’t be, surely? Or could it? We are told there will be more surprises with Hazel the following week, but we doubt they will be pleasant ones. In this week’s episode of “Gaye’s Gloomy Ghost” we see the Arthurian legend like we’ve never seen it before. According to Sir Roger, the real-life Sir Lancelot was a fat, short, bald man with a filthy temper and thick spectacles! He inadvertently creates the famous Round Table when he gets into a fight with Sir Roger over porridge. Gaye doesn’t believe a word of it, but the story’s so funny I put it up on the Hugh Thornton-Jones page in the panel gallery. It’s part two of the kids vs. adults sports competition in “Tansy of Jubilee Street”. The adults are into serious training, but Tansy has to find surreptitious ways to get the kids off their butts and do it too. Minnow is now joining a swimming club, but again she has to do it behind her mother’s back. And while in Mum’s room she finds more strange clues to the mystery: letters in a foreign language and a photo that shows Mum and Dad used to be swimming champions! So why’s Mum got such a thing against swimming now? In “Blind Faith” Clare has to do some breaking and entering to rescue Cromwell from the knacker’s yard – but she’s been spotted doing so! Katie’s jinxing has a water theme this week, from jinxing water skiers to having the swimming team walk miles in the rain. Judy tries to get help from the police about the haunting, but of course they’re not going to believe a thing like that. And Judy is even more terrified to realise that whatever is causing the haunting and making her friends dress like Victorian girls is going to target her next! Gwen is riding high on the glory she has stolen. Of course that means a fall sooner or later, and it is already starting. Julie Waring is getting suspicious and has also overheard Gwen’s troubled conscience speaking out loud. Is Gwen about to be caught out? The girls try to bust out of Misery House, but they not only fail but are also duped into playing a cruel trick on Carla, who was caught during the escape. One up to Misery House, but we know there will be a next time. Angela’s Angels are accused of stealing, but it turns out the patient was foisting the blame onto them. We see acid-drop Angela has a heart: she sticks up for the Angels when they are accused and covers up for one somewhat errant Angel later on. The scheming girls did not mean Yvonne to take a fall down the stairs when they soap the soles of her shoes, and only her acrobatic skills save her. It doesn’t cut much ice with jealous Lisa though, who is furious when Yvonne is chosen over her for the Dance of the Four Cygnets. Miss Madden’s test for Mandy this week is very odd, even for her. She has Mandy dress up like a princess and then puts her in a posh room, where a two-way mirror enables Miss Madden and her colleagues to watch Mandy. Then Mandy panics for some reason when she hears the tune from a music box. Now what could have brought that on? The influence of the Indian necklace has Gail’s friends turning away from her while she gets very sneaky and deceptive in getting what she wants. Daisy’s Victorian employers turn up their noses at coconuts and are not impressed with her fishing. It all ends up with their going hungry and Daisy slipping away, full of fish, so they don’t lumber her again. Dora helps out a dog that is being mistreated, but makes sure the dog doesn’t go to the dogs’ hotel either. Katie fools a pony-napping gang in the cover story – there are some crooks who are stealing away the foals of some wild ponies and selling them to a nearby pony riding school. You’d think the school would soon spot that the ponies are wild, but the crooks tell them that ‘they’ll soon settle down’! Well, luckily Katie has hitched a couple of rides – first on one of the mother ponies trekking after her stolen baby, and then in the truck taking the ponies away. So she soon foils the plans, and is a hero to the neighbourhood. Tricia’s tragedy takes place in this issue – cousin Diana dives too close to Tricia when she is in the pool, and the next thing Tricia knows, Diana seems stunned… unconscious! and when she wakes up, suddenly the cousin has been struck blind. In Merry at Misery House, she is trying to get to the bottom of the mystery of the sinister figure – the joker who is turning the place upside down, but only at times when Merry is blamed for the pranks! But at last the prankster gets Miss Ball dismissed as deputy warden – and Merry finally gets a clue as to what is happening. We are promised that she will be unmasking the joker – next week. The Prisoners of Paradise Island aren’t yet seeing through the luxury trap that Miss Lush has set for the hockey team. Sally Tuff has managed to get out a radio message to Miss Granley, their sports mistress – will she be the saving grace? It is the last episode of Always Together…. Little sister Beth is desperately ill but all is sorted out in the final few pages – even to the extent of restoring the lost mother and the family home! Finally, in “Slave of the Mirror“, Mia is still being manipulated by the mirror at the times when she feels most resentful for her sister’s bossy ways. But nice old Major Rose has build Mia a beach hut that she can escape to when she feels stressed out. She does so, and prepares to go for a dip – unaware that she is being watched by two men. Are they sinister stalkers such as we would expect them to be nowadays, or far more benign?